Do the Secret Service's Security Lapses Go Past the White House? The Secret Service is a joke. That's harsh, I know—and it's unfair to Secret Service agents who unflinchingly risk their lives for the president and for their country. But it's true, and it needs to be fixed. Here's how. First, fire Director Julia Pierson. Her agency covered up a 2011 incident in which shots were fired at the White House, when one of President Obama's daughters could have been killed. Her agency allowed a mentally ill Iraq war veteran to rampage through the White House with a knife. Her agency permitted a security contractor with a gun and three assault convictions to ride an elevator with Obama -- then, reportedly, tried to cover it up. In each case, her agency concealed details from the president and the public. Her agency lied. It distributed facts that were known to be false, such as the initial claim that the fence-jumper was unarmed. In short, there is overwhelming evidence that the Secret Service is rotting from atop. She pledged reviews, reports, inquiries, and assessments—a brimming thesaurus of self-examination—and tried to run out the clock. She muttered sentences like this: "In downtown areas, there is sound attenuation." This was a reference to the Secret Service's confusion in 2011 over whether someone had been shooting at the White House or a motor vehicle in its vicinity had backfired. Pierson three times uttered the Watergate-era dodge "mistakes were made." No, a mistake is locking your keys in the car. Trapping the president and his security detail in an elevator with an armed felon is professional malpractice. When the The Washington Post and Washington Examiner posted news of that incident Tuesday, the reaction on Twitter seemed to hit in waves. Disbelief, shock, anger, and the awkwardly familiar coping mechanism of morbid humor. 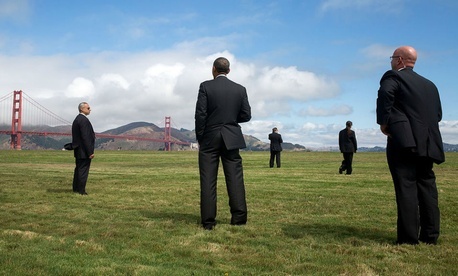 SECRET SERVICE AGENT LEAVES POTUS IN HIS OTHER PANTS. @samsteinhp @ron_fournier honestly, completely not funny. Tweets like hers reminded me that I've had the honor of knowing many Secret Service agents. During the Clinton and Bush administrations, I worked daily inside both the White House and the security "bubble" that accompanies presidents on trips outside Washington. Countless long days on the road ended in long conversations with proud agents, who parsimoniously shared details of their families, their jobs, and their willingness to end it all to save a president. After 9/11, some of these same agents warned me that no good would come from plans to yank the quasi-independent agency out of the Treasury Department and fold it into the fledgling monstrosity that would come to be known as the Homeland Security Department. "We are who we are because we aren't a bureaucracy," a senior Secret Service official told me in February 2003, a month before DHS swallowed the service. Which brings me to the second way to fix the Secret Service. Congress should reverse the Bush-era mistake and give the agency back its mojo. At the Treasury Department, the Secret Service's leadership had autonomy, and its agents were encouraged to consider themselves elite. The Secret Service was not just the leading law-enforcement agency at Treasury, it was at the apex of the entire profession. Only the best cops became agents. The Secret Service leadership could draw on the agency's reputation and relative independence to defend its budget, its professionalism, and its mission from political encroachment. Before 2003, the director of the Secret Service was a player—somebody even the president and members of Congress had to think twice about crossing. By contrast, Pierson—and, I would argue, any Secret Service director inside the DHS labyrinth—is just another bureaucrat fighting for turf, money, and autonomy in one of the largest, least-efficient agencies in Washington. As we see at the Internal Revenue Service, the National Football League, and the many other acronymed entities, it's easy to lose sight of your calling from inside an ossified institution. Secret Service personnel, particularly those in uniform, are often paid less today than law-enforcement officials in other agencies. More than the money, the agency's declining reputation in the law-enforcement community—a trend that goes back to 2003—has hurt morale and recruitment. Also diminished are efforts to develop the agency's "brand," the little-known marketing efforts that supported books and movies and other pop-culture references to the Secret Service, which in turn made the presidential detail an iconic, aspirational profession. People used to worry that the Secret Service had too much independence, that its agents and leaders were bureaucratic cowboys who answered to almost nobody. There was something to those concerns, but at least presidential security wasn't a joke.